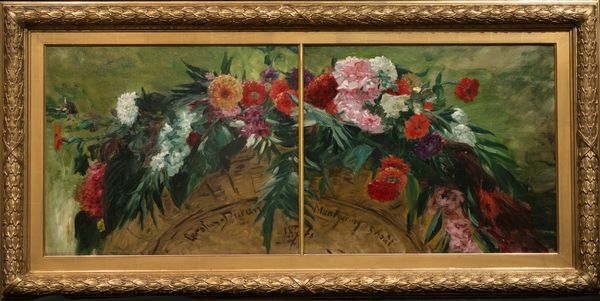 This two-paneled painting depicts an arrangement of blooming flowers located in Montegeron, France, outside of Paris. Carolus-Duran and other Impressionist artists such as Edouard Manet (1832-1883) and Claude Monet (1840-1926) frequently visited this countryside location. This image may have been painted while staying at the country estate of a patron. The rich colors and textures of this painting exemplify Carolus-Duran's spontaneous painting technique and depict the typical romantic landscape gardens of nineteenth-century France. Landscape gardens, which were influenced by English picturesque gardens, rejected the strict symmetry of seventeenth century French formal gardens. The new gardens instead sought an idealized naturalness that featured planned spaces to evoke emotions in reaction to the sublime and beautiful views, while still appearing wild or untamed. This improvisation and spontaneity found in both the painting technique and the landscape garden Carolus-Duran is depicting reflects the popular romantic ideals of wilderness and the course of nature.